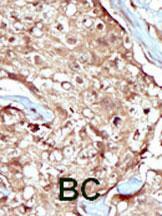 This PAPSS2 antibody is generated from rabbits immunized with a KLH conjugated synthetic peptide between 544-574 amino acids from the C-terminal region of human PAPSS2. Small volumes of anti-PAPSS2 antibody vial(s) may occasionally become entrapped in the seal of the product vial during shipment and storage. If necessary, briefly centrifuge the vial on a tabletop centrifuge to dislodge any liquid in the container`s cap. Certain products may require to ship with dry ice and additional dry ice fee may apply. The anti-PAPSS2 Pab is used in Western blot to detect PAPSS2 in Jurkat cell lysate. NCBI/Uniprot data below describe general gene information for PAPSS2. It may not necessarily be applicable to this product. PAPSS2: Bifunctional enzyme with both ATP sulfurylase and APS kinase activity, which mediates two steps in the sulfate activation pathway. The first step is the transfer of a sulfate group to ATP to yield adenosine 5'-phosphosulfate (APS), and the second step is the transfer of a phosphate group from ATP to APS yielding 3'-phosphoadenylylsulfate (PAPS: activated sulfate donor used by sulfotransferase). In mammals, PAPS is the sole source of sulfate; APS appears to be only an intermediate in the sulfate- activation pathway. May have a important role in skeletogenesis during postnatal growth. Defects in PAPSS2 are the cause of spondyloepimetaphyseal dysplasia Pakistani type (SEMD-PA). A bone disease characterized by epiphyseal dysplasia with mild metaphyseal abnormalities. Clinical features include short stature evidenced at birth, short and bowed lower limbs, mild brachydactyly, kyphoscoliosis, abnormal gait, enlarged knee joints. Some patients may manifest premature pubarche and hyperandrogenism associated with skeletal dysplasia and short stature. 2 isoforms of the human protein are produced by alternative splicing. Kurima, K., et al., J. Biol. Chem. 274(47):33306-33312 (1999). Kurima, K., et al., Proc. Natl. Acad. Sci. U.S.A. 95(15):8681-8685 (1998). Shimizu, C., et al., Biochem. J. 363 (Pt 2), 263-271 (2002). 1. PAPSS2-brachyolmia includes phenotypes of the conventional clinical concept of brachyolmia, the Hobaek and Toledo types, and is associated with abnormal androgen metabolism.